Right there in the Philadelphia Eagles locker room, is Buffalo East. Side by side, a pair of Buffalo natives dress together, play together, and win together. Steve Means and Corey Graham both grew up on the East Side. Both went to city schools. Both have used hard work and determination to represent The 716 at the big game. Graham will make his second appearance in the Super Bowl. For Means, his debut is the highlight of his NFL career. Means is a backup defensive end for the Eagles. The former UB Bull has played in six games this season, with one sack. He has been inactive for Philadelphia’s two playoff games, and may wind up being inactive for the Super Bowl. Steve’s problem is he is part of the deepest defensive line in the NFL. But that doesn’t mean he isn’t a valuable member of the team. Steven Means joined Paul Peck & Kevin Sylvester on the Daily Drive Podcast. 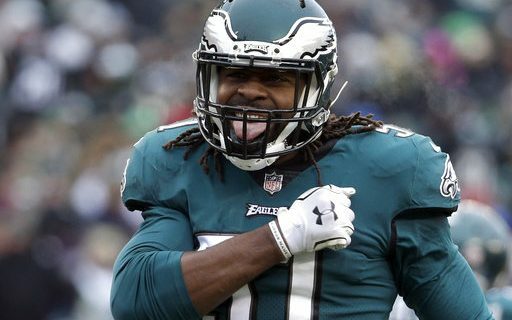 Even though he doesn’t always suit up on Sunday, it’s what Means does during the week that has made him an admired leader in the Eagles locker room. As a part of the scout team, Means is constantly going against two of the best tackles in the NFL, Jason Peters (before he was hurt) & Lane Johnson. The Eagles arrived for the Super Bowl in Minneapolis on Sunday night. Means spent time asking Graham what to expect. It’s not the first time Means followed in Graham’s footsteps. When he played for the Fruit Belt Rockets, the fellow Buffalo East-sider won the Corey Graham Trophy. Hopefully, Means gets his chance to suit up on Sunday in the big game. If he does, it’ll be pretty cool to see two alums of Buffalo, the East Side and the Fruit Belt Rockets on the biggest stage in the NFL. Read Paul’s story on WNY native Brett Kern’s NFL Pro Bowl debut.